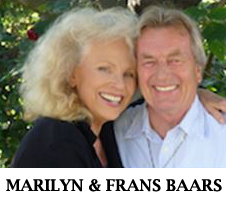 Marilyn and Frans Baars invite you to join them in a JOYSHOP* (aka, “Workshop”) with The Archangels. This JOYSHOP* will be a day of “Total Immersion” in the loving energies of LIGHT from The Creator Source of All There Is as presented by The Archangels. Marilyn has been channeling messages and healing energies from The Archangels for over 30 years. These messages contain valuable and practical information for day-to-day life on Planet Earth. During the JOYSHOP* Marilyn & Frans will share this information with participants—information that involves learning how to tune in to the vibrations of the Fifth Dimension, and how the powerful energies streaming onto the Earth from our Sun can be transmuted and utilized through the “Incoming Energies Protocol” of The Archangels, as well as ways to change your vibrational level to one more in tune with Universal Light Energies of Love. The JOYSHOP* will be a day of receiving new energies from The Creator via The Archangels, energies of love, joy and friendship. And, if you so desire, these new energies can connect you with The Archangels in such a way that you can contact them personally. In the afternoon, Marilyn will channel a “live” message from The Archangels especially for the participants of this JOYSHOP*. A copy of the message in MP3 format will be sent to you via the email address that you provide when you register for the event. You will receive the MP3 mid-October, as the Baars will be travelling onward to Israel after the JOYSHOP* in Baarn. In 2013, The Archangels asked Marilyn & Frans to consider using the word “JOY” instead of “WORK” when speaking or writing about their interactions with The Archangels. They told them that the word “JOY” brought with it energies that are more lively, loving and uplifting than the word “WORK”, and would therefore convey to clients and to “workshop” participants a sense of lightness and fun that other terms do not. The Baars have decided to call all their meetings “JOYSHOPS” in order to change the expectations and perceptions of participants from “work” to “JOY” during such meetings. TIME: From 9:00AM until about 5:30pm.NB: We ask you to be flexible with the end-time because of the afternoon channeling session, since we do not know how long The Archangels will speak. 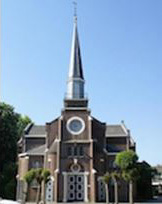 Parking is free in the parking lot of the church and at the P+R parking at Baarn Station. Walking from the station to the Paaskerk Zalencentrum “Het Brandpunt” takes approximately 5-10 minutes. From 9:00 till 9:30AM. The JOYSHOP will begin at 9:30AM. Marilyn & Frans invite you to join them at the Lunch Buffet at the end of the Morning Session. In a special ceremony, the Baars will ask The Archangels to bless the food and drink and to infuse everything with the Highest Vibrations of LOVE and LIGHT. Bread, various sandwich fillings, soup, milk and orange juice will be available. If you have special dietary needs, we advise you to bring your own lunch; there is no rebate possible for this option. Throughout the day, breaks will be provided for complementary coffee, tea and water (from the tap). If you prefer bottled water, please bring your own. The Fee is € 88,00 per person for those who register and pay before 22 August 2015. After 22 August 2015, and on the day of the JOYSHOP, the Fee is € 98,00 per person. There is a € 25,00 Fee per person for cancellations up to 24 hours ahead of the event. There will be NO REFUNDS for those cancelling after the 24-hour deadline. Please add the word “JOYSHOP” to your booking. Booking is complete after we receive your payment. Marilyn will be speaking English during the JOYSHOP, and Frans, who is a native of The Netherlands, will translate into Nederlands when necessary, or when requested to do so. Questions may be asked in Nederlands or in English. We kindly request that you avoid wearing perfumes and fragrances of any kind, as there may be participants who are sensitive to such things. Frans will make an MP3 format recording of the channeled message during the JOYSHOP, and it will be sent to all attendees after October 20, 2015, as the Baars will be travelling onward to Israel for a Conference after the JOYSHOP. Marilyn was a professional opera singer from 1967 to 2003. She met Frans in 2004 during a Steve Rother seminar in Hawai’i. They married in Hawai’i in September 2005, and together they facilitate healings with the channeled energies of The Archangels. In appreciation of your participation in in their JOYSHOP, the Baars offer you as a gift their book of the Archangels’ channeled messages “THE GOLDEN ESSENCE IS YOU” as a permanent remembrance. This book of messages from The Archangels is filled with their energies, not only in the paper, but also in the ink, in the words, in the rhythm, in short, in everything. The vibrations and frequencies in the meditations and visualizations bring the reader closer and closer to Enlightenment and Ascension. Much of the information presented during the JOYSHOP comes from this book.